Well, strictly speaking, the Steves Homestead isn't what you'd really think of on hearing it called a homestead. It's more of a splendidly ornate, Second Empire French mansion, with a slightly in-curved mansard roof topped with a spiky crown of iron lace. It's one of the jewels of the historic King William district ... which was San Antonio's very first luxury suburban neighborhood. The tallest and most identifiable building in King William is the very industrial Pioneer Flour Mills – which in turn had been founded by one the mid-19th century mercantile kings of San Antonio, C.H. Guenther. 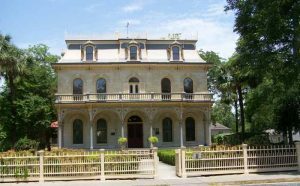 Guenther was one of those German immigrants who established so much of San Antonio's industry and business – and Edward Steves, the original builder of the homestead was another. He founded and ran a profitable lumber business, as well as being extremely active in the social affairs of the German community. Whatever there was in the way of arts, cultural affairs and community betterment in San Antonio in the mid-19th century was usually the doing of the prosperous Germans. 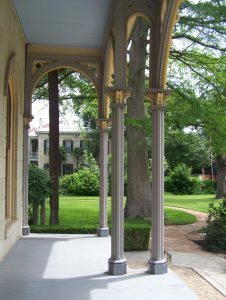 The extended Steves family had originally settled in Comfort, but when Texas began to recover from the Civil War, Edward Steves moved to San Antonio with his wife, Joanna. When the railroads reached San Antonio in the mid-1870s, the town expanded almost geometrically. Oddly enough, although the house looks huge from the street – it is actually rather manageable on the inside; the main floor is a block of four rooms and a stair hall down the middle, with a little conservatory built out on one side, and a range housing the kitchen and servant's quarters out at the back. 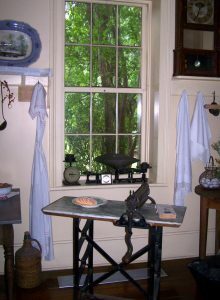 The rooms are comfortable and airy, with high ceilings and tall windows shaded by mature trees; just so rooms had to be in the days before air conditioning. 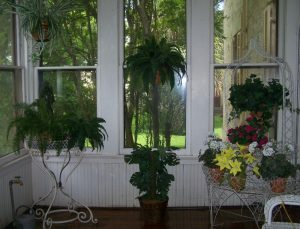 Many of the furnishings were bought new for the house by Joanna Steves; she kept only a very ornate hall tree made in New Braunfels from the previous house. Some of the art and furnishings came from Europe – one of the most spectacular is a circular table in the formal parlor with a micro-mosaic inlaid top featuring views of Ancient Rome which look like incredibly detailed paintings. The various roundels have large magnifying glasses laid out on them so that visitors can look and marvel at what was made with mosaic tiles hardly the size of the head of a pin. 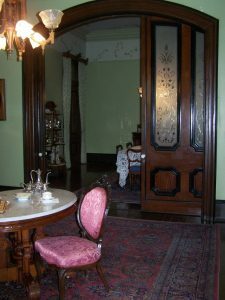 Mr. Steves had a home office – with a separate entrance at the side of the house, and in back of the formal parlor. On the other side of the hallway was the informal parlor, with the dining room in back of that. The kitchen was around a short dog-leg corridor – to baffle the heat of the stove and the smells of food preparation – and everything is furnished with bits and pieces, just as it would have been ... or if not as it would have been, as close as it is possible to get. At least a hundred years separate the Steves mansion from the Spanish Governors' Palace – and the difference between them is most noted in the kitchen; a huge iron stove served the Steves' cook, while the old Spanish establishment made do with something that looks rather more like a wood-fired pizza oven. Out in the back, and on the riverbank behind the house is another curiosity – an indoor swimming pool. This is supposed to have been the first ever in San Antonio; Joanna Steves went swimming in it every day on the dot of 2 PM. This recalled to me the observation of urban garden planner and writer Frederick Law Ohmstead, who had visited San Antonio in 1855 – and noted that all the very best houses had gardens which ran down to the river, and the residents spent many happy hours in the hot summertime bathing and swimming in the cool water. Well, that was the only way they had to beat the summer heat then, wasn't it? The Steves homestead, and the neighboring streets in King William and Southtown are well worth a visit.